InnerChef is an online food delivery service provider based in Gurgaon. It delivers on demand ready to cook meal boxes to the customers. Currently, lunch and dinner services are offered by the company in Gurgaon which is soon to be expanded in other metro cities. 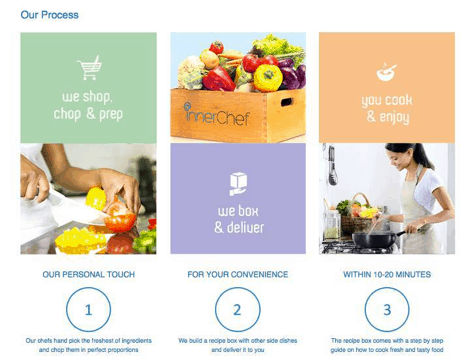 Angel investor and entrepreneur Rajesh Sawhney has launched InnerChef, an online food discovery and delivery platform and entered into the $300 billion food industry of India. The startup is all set for the ready to cook meal delivery service. Mr Rajesh is also the founder of GSF accelerator, which is India’s leading technology accelerator and seed funding platform. Rajesh Sawhney before launching this firm has been working with many renowned brands. He worked as the founding president of Reliance Entertainment and founding architect of Times Internet. Other co-founders of InnerChef include Uday Bansal who is also the founder and CEO at Skybulls, Rahul Samat an ex-product manager at Barclay’s, Bal DiGhent who is the founder of DiGhent Cafe in Gurgaon and Heena Karia Thakkar who is a professional chef. The profile and achievement of the company forced us to choose it as Startup of The Week. Within a short span of time after the inception, it has covered the city of Gurgaon and has running plan to expand in major metro cities of India covering Delhi, Bangalore and Mumbai till July this year. Observing the enthusiasm and zeal of the team members and their long achievement in this very short time, we selected this company as one of the strong startup of the week. Within a month, the company has around 700 fans on its Facebook page and more than 120 followers on Twitter. The company engages their customers on the social media by regular posts. The startup is currently utilizing the funds to balance up sales and marketing and build its contract lifecycle management product. They are also pushing their service to wider market; expanding the destinations and increasing their team size. The Gurgaon based company was started this year in April. It delivers on demand ready to cook meal boxes to the customers. The box includes all the necessary ingredients required to cook the food and give a final touch. A recipe card inside the box ensures the right way to finalize the meal. The delivery service is currently started in Gurgaon only and is expected to expand to Delhi, Mumbai and Bangalore by the end of July. Currently the service of lunch and dinner with 16 types of dishes is being offered and is planned to expand the dish recipe to 30 between April and June. “All our dishes can be prepared in 10-20 minutes. The whole idea is to give people food that’s fresh, and anyone can be a chef now”, said Sawhney, the founder of InnerChef. People are going greedy and crazy when it is a matter of food and eating. They need options of food items to choose from. For proper flourishing of the business and to have an advantage over the competitors, InnerChef will have to offer a range of cuisines not just limited with home-cooked food. Its food is priced from Rs200 to Rs400. “The price range of the cuisines should be lower than a restaurant to reach to the target customers”, said a market research analyst. The food retailing industry in India is of over $300 billion. Day by day the percentage of people is increasing who are moving towards online food ordering service. Its result was seen in a research showing the home delivery food market growth rate of 40% yearly and is expected to reach $10 billion by 2016. Assembly of food delivery system and technology has created a space for the emerging industry in the market and it is creating new standards. According to an estimate, total investment in Food and Technology business has reached over $2.3 billion in 2015 alone till now which was $1.2 billion in the whole year of 2014. In the recent few past months, we have seen a huge sum invested in the online food market. Last month, BiteClub, a Gurgaon based firm to deliver lunch and dinner raised $500000 in seed funding. Spoonjoy has also received an undisclosed amount from the leading digital merketers naming Flipkart’s co-founder Sachin Bansal, co-founder of Delhivery Sahil Barua, founder of tracxn Mr Abhishek Goyal and Mekin Maheshawari, CPO of Flipkart. Many other startups have raised funding in the past few months and we are waiting for InnerChef to announce any kind of fund raising. The firm is growing rapidly under the entrepreneurship and marketing strategy of Mr. Rajesh Sawhney and with the strong foundation team of experienced guys. Since the company’s owner Mr Rajesh Sawhney is himself a funder and investor for other startups, so we hope in the coming time, his own company InnerChef can be seen at a leading position in the industry.